“In about an hour after we arrived, the eating and drinking began. There was coffee with whipped cream (lots), six or seven kinds of sandwiches made with cheese, liverwurst and such good things: whole platefuls of rich little pastries, coffee cake, chocolate raisin cake, peach cake and orange cake. “This, keep in mind, was just a little light afternoon tea. The real feast of the day, the birthday dinner, hadn’t arrived yet, nor had the birthday drinks, of which more anon. After eating all these good things, we drifted back into the yard. “At this point, the strictly musical portion of the evening was interrupted by the advent of some more pastries, a bottle of Black and White whiskey (one of several bottles which had been most appropriately brought to the old man in honor of the great day) and some glasses. I tried a little—a very little—of the whiskey, in spite of Uncle Arnold’s merciless twitting. Then…supper was called! This according to Newlin’s Schoenberg remembered: Diaries and recollections, 1938–76 (New York: Pendragon, 1980). Many thanks to Tina Frühauf for bringing this to our attention! 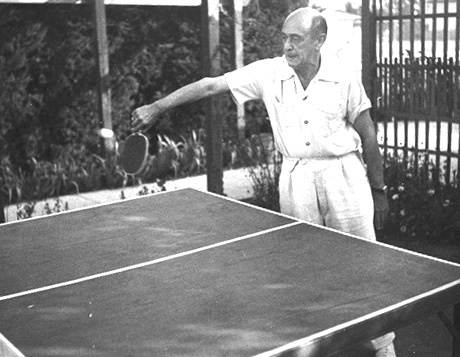 Above, the inventor of serialism playing ping-pong in L.A.; below, Dr. Newlin sings Lee Hazlewood’s These boots are made for walkin’.